Above Photo: From Ujima’s citywide assembly “Old Roots, New Rules,” October 2018. The work of Springboard for the Arts is rooted in arts-based economic and community development. We believe artists are critical assets in that work, and support them by offering a variety of resources that enable them to make both a living and a life. This is why Springboard is a member of the New Economy Coalition (NEC): because we believe in the vision of a new economy, one that is just, sustainable, and democratic; one that is ethical and community-rooted; and one that does not rely on the exploitation of disenfranchised communities in order to thrive. This is the seventh in a series of stories highlighting the work of other arts-based NEC member organizations and organizations with complementary values that have developed ways to sustain themselves while also sustaining artists, demonstrating that, yes, a new economy is possible. Read the rest of the series here. The Boston Ujima Project is a community-led organization with a mission of growing a people’s economy in Greater Boston, one that is controlled by the community with neighbors, workers, business owners, and investors all working together on a shared vision of collective work and responsibility. 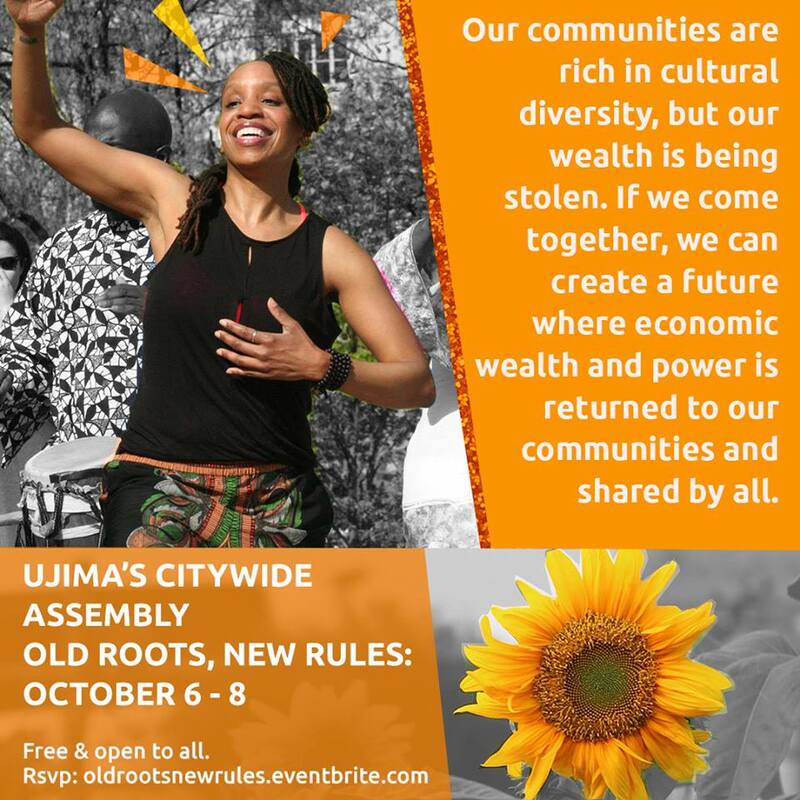 From Ujima’s citywide assembly “Old Roots, New Rules,” October 2018. The idea is to challenge poverty and develop local neighborhoods by organizing individual savings, businesses, and customers to grow their own wealth and meet their own needs. The word ujima is a Swahili word that refers to the Kwanzaa principle of collective wealth and responsibility. 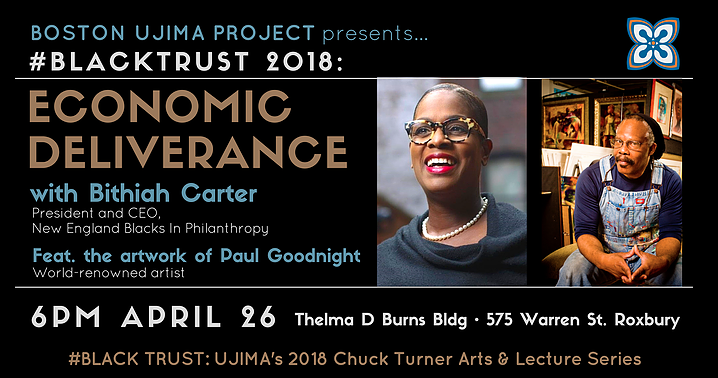 The Boston Ujima Project demonstrates new ways to invest, work, buy, own, and advocate to create greater economic equity and autonomy in areas where there is very little, particularly Boston’s working-class communities of color. At its core, the Boston Ujima Project is a democratically-governed grassroots community organization that abides by the principle, “One member, one vote.” Voting members must live in the city of Boston, and the votes of members and community organizations take precedence over the desires of businesses and investors (who will still provide input but will not direct the organization’s efforts). Non-voting “solidarity” members from Greater Boston and beyond are also encouraged to get involved. 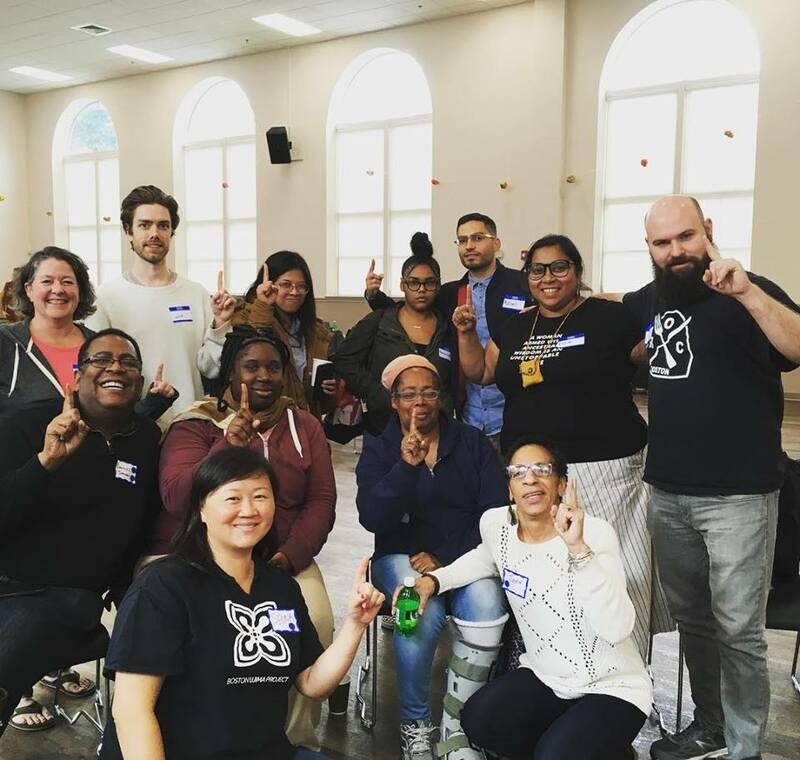 The Boston Ujima Project works closely with other existing community organizations and civil rights groups on planning and investing efforts, and aims to invest in businesses rooted in social justice movements that pay living wages and offer benefits. Their long-term vision is to work with investors and continue to grow their investment fund while developing a pipeline of business ready for investment. From the Roxbury Neighborhood Assembly, April 2018. 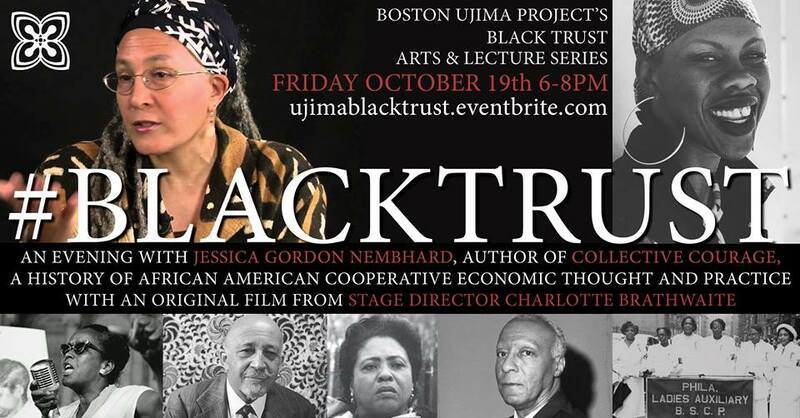 In the last year, the Boston Ujima Project has also been emphasizing the role the arts play in equitable economic development after writer, performance artists, and community organizer Cierra Michele Peters came on board. 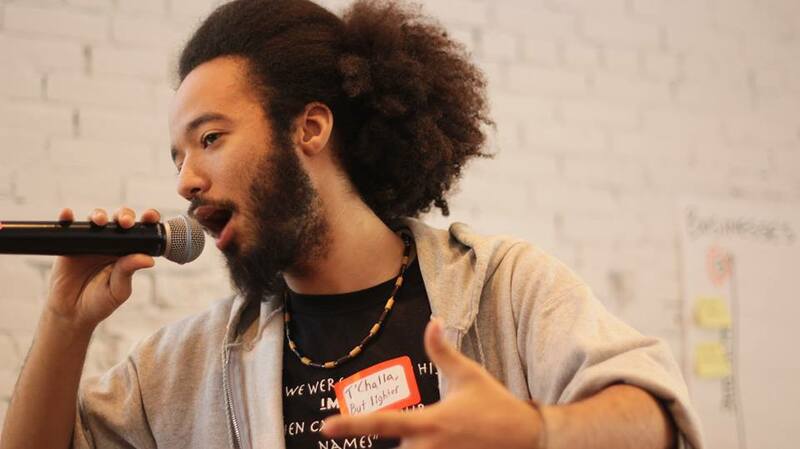 Peters had spent four years working as a community organizer and artist in and around Boston before joining Ujima. She traveled to different cities like New York and Philadelphia to see what alternative art models looked like outside of cultural institutions, and a friend of hers suggested that she bring that conversation to the Boston Ujima Project steering committee, who were already leading that kind of equitable economic work, but lacked a focus on the arts. Ujima arts and cultural organizers Cierra Michele Peters and DJ Dee Diggs present their original “Ujima: Black History Month” audio and visual mix. Early in 2017, Peters, as Ujima’s first arts and cultural organizer, began to imagine what the future for artists could look like. Ujima officially launched in the fall of 2017 with the founding members event, Dreaming Wild. At this event, five seed grants of $500 each were awarded to different artists who applied for them that were voted on by Ujima members. Peters was able to orchestrate these grants through a local bank that donated the seed money. The grantees included the feminist E-Volv Tech Music Festival, a project called Love vs. Lust about destigmatizing sexuality in the Black community, and a mural project highlighting the Vietnamese community in the Boston neighborhood of Dorchester. There is also a residency program in the works, which Peters says many artists of color don’t often have access to if they didn’t attend an Ivy League school or come from a more privileged background for which access to such programs is automatic.